Copyright: © 2013 Clemens et al. 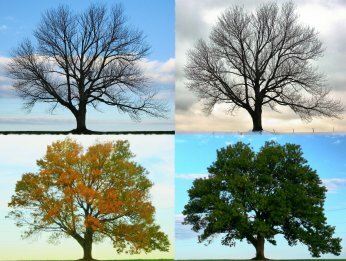 Seasonal variation has been reported for several disorders, including those of the nervous system. This variability is usually regarded as reflecting fluctuations in vitamin D level. Although epilepsy has also been reported to exhibit some seasonal features only one previous study assessed seasonal distribution of the epileptic seizures themselves. 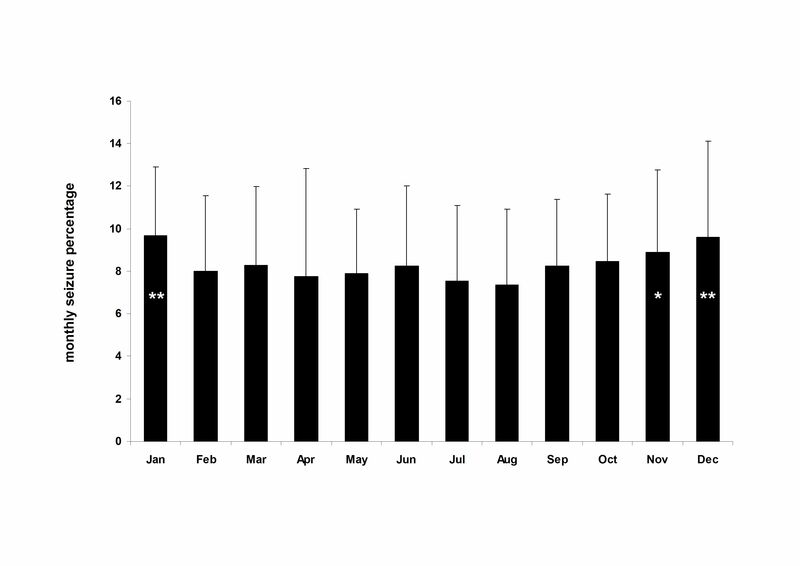 Based on individual seizure diaries here we evaluated seizure distribution across calendar months. At the group level seizure counts peaked in January and reached a nadir in August, a seasonal pattern consistent with that found for a variety of other neurologic and systemic disorders. This finding together with other types of evidence suggests a role for vitamin D deficiency in epilepsy. Several disorders, systemic as well as those of the central nervous system, are known for exhibiting seasonal fluctuations with highest incidence or more severe symptoms during winter as compared to summer. This feature is usually regarded as a sign of a disorder being vitamin D dependent as circannual fluctuations in vitamin D levels follow that of sunshine hours and solar UV-B radiation . Systemic diseases most well known for seasonal variations include acute myocardial infarction  infectious diseases  and cancer . Several neurological disorders such as migraine , stroke  as well as schizophrenia  have also been reported to fluctuate seasonally. Also epilepsy has been shown to exhibit some seasonal features: epileptic births [8-10], febrile seizures , onset of epileptic spasms  as well as photoparoxysmal discharges  have been shown to occur more frequently during winter months. Only one study has assessed the seasonal distribution of the epileptic seizures themselves . This study was based on seizures that were logged at an epilepsy inpatient ward throughout a year and indicated higher seizure frequency during winter as compared to summer months and intermediate frequencies during spring and fall. Here we carried out a study to assess possible seasonal distribution of seizures based on individual seizure diaries from epilepsy patients. Seizure diaries were obtained from epilepsy patients followed by the epileptologists of the Epilepsy Center in the National Institute of Neuroscience, Budapest. Paper-based seizure diaries were photocopied. A few patients have kept seizure diaries digitally. Patients were asked to assess the reliability of their seizure diary. If the patient assessed his or her diary not to be reliable for any reason we did not include it into the analysis. Patient explanations for non-reliability typically included non-adherence to strictly record seizures or being not aware of some seizures for example those occurring during the night. We also excluded diaries from patients with a history of psychogenic non-epileptic seizures. Those diaries with less than twelve consecutive months were also excluded. Seizure diaries included in the study originated from 62 patients. These patients were between the ages of 19 and 61 years (mean±SD: 37.3±11.9) at the time of the study. Age at epilepsy onset was between 0 and 34 years (mean±SD: 11.1±8.7). The study population was heterogeneous with regard to epilepsy syndromes: 59 patients had localization-related epilepsy, two had Lennox-Gastaut syndrome and one had idiopathic generalized epilepsy. All patients were taking antiepileptic drugs. The study was approved by the local ethical committee and patients gave written informed consent to use their data for scientific analysis. Seizures were counted for each calendar month. If a patient had more than one seizure type the different types were summed. Epileptic auras were not encountered as seizures. In those patients whose seizure diary spanned more than twelve months the respective months were averaged. Seizure counts were normalized to a 30-day length. In a next step, for handling the substantial difference in seizure numbers across patients, seizure counts were transformed and expressed as percentages in each patient such that the sum of the 12 monthly percentages equals100%. For statistical analysis these monthly percentages were compared. First repeated measure one-way ANOVA with twelve levels was performed to assess main effect. Then paired t-tests were used to compare months. Altogether 3011 months and 45,833 seizures originating from 62 patients were included in the analysis. Individual seizure diaries on average contained 49 months (SD: 51, range: 12-276 months). At the group level average seizure counts peaked in January (9.7%) and decreased until August the month representing a nadir in seizure counts (7.4%). Thereafter monthly seizure counts progressively increased until December (9.6%). Repeated measure one-way ANOVA with a Greenhouse-Geisser correction indicated a significant within-subject main effect (F(7.79, 475.17)=2.22, p=0.026). Post-hoc comparison of monthly values of August with those of the other months revealed significant difference for January (p=0.001), November (p=0.03) and December (p=0.003). The difference between the percentage averages in August and January was 31.1%. Fig.1.Mean±SD for monthly seizure percentages. There is a decreasing trend from January to August and then an increase across the rest of the year. Asterisk indicates significant differences (*p<0.05, **p<0.005) for a comparison with August the month representing the nadir for seizure counts. The seizure numbers showed a significant seasonal pattern for epileptic seizures with a peak in January and a nadir in August. This finding is in line with a previous study that found highest seizure numbers during the three winter months and lowest during the three summer months when retrospectively analyzing seizures logged at an epilepsy inpatient ward throughout a calendar year . In that study the seasonal pattern hold true for generalized, complex partial as well as simple partial seizures but not for unclassified (presumably non-epileptic) seizures. Some other epilepsy-related phenomena such as epileptic birth rates [8-10] and photoparoxysmal discharges  were also shown to exhibit seasonal pattern. Importantly, Danesi, an author of several early papers on seasonal  and geographical  aspects of epilepsy, was the first to relate these phenomena to differences in the amount of sunshine and vitamin D levels. There is a more direct evidence supporting the anticonvulsive effect of vitamin D coming from our recent study . In that study we showed that administration of vitamin D3 results in seizure reduction with a median of 40%. Another study carried out nearly forty years ago  indicated a seizure reduction of ~30% following administration of vitamin D2 but no significant seizure reduction in the placebo group. The anticonvulsive effect of vitamin D was also evidenced in animal studies [18-20]. There is a more direct evidence supporting the anticonvulsive effect of vitamin D coming from our recent study . In that study we showed that administration of vitamin D3 results in seizure reduction with a median of 40%. Another study carried out nearly forty years ago  indicated a seizure reduction of ~30% following administration of vitamin D2 but no significant seizure reduction in the placebo group. The anticonvulsive effect of vitamin D was also evidenced in animal studies [18-20]. Some other mechanisms such as those related to temperature, light exposure and associated hormonal fluctuations could also be suggested to explain seasonality. Yet we are not aware of evidence supporting a relationship between these environmental factors and epilepsy with a same direction and size as seen in our study. Seasonality is generally overlooked in the clinical practice of epilepsy. Nevertheless the average difference amounting to 31% between January and August is considerable. We suggest that the seasonal effect should be held in mind when assessing the efficacy of antiepileptic drugs over a time period of months. More importantly, seizures exhibiting seasonal pattern, together with other direct and indirect evidence, strongly support a role for vitamin D deficiency in epilepsy. Epileptic seizures peaked in January while a nadir was present in August. Such a seasonal variation can be regarded as an indirect evidence for vitamin D deficiency being involved in the pathophysiology of epilepsy. This work was supported by grants SROP-4.2.1.B-10/2/KONV-2010-0002 (Developing Competitiveness of Universities in the South Transdanubian Region), SROP-4.2.2/A- 11/1/KONV-2012-0017) and PTE ÁOK-KA-2013/34039. 1. Thuesen B, Husemoen L, Fenger M, Jakobsen J, Schwarz P, Toft U, Ovesen L, Jørgensen T, Linneberg A. Determinants of vitamin D status in a general population of Danish adults. Bone 2012; 50: 605-10. 2. Spencer FA, Goldberg RJ, Becker RC, Gore JM. Seasonal distribution of acute myocardial infarction in the second National Registry of Myocardial Infarction. J. Am. Coll. Cardiol. 1998; 31: 1226-33. 3. Grassly NC, Fraser C. Seasonal infectious disease epidemiology. Proc. Biol. Sci. 2006; 273: 2541-50. 4. Calip GS, McDougall JA, Wheldon MC, Li CI, De Roos AJ. Evaluation of seasonality in the diagnosis of acute myeloid leukaemia among adults in the United States, 1992-2008. Br. J. Haematol. 2013; 160: 343-50. 5. Soriani S, Fiumana E, Manfredini R, Boari B, Battistella PA, Canetta E, Pedretti S, Borgna-Pignatti C. Circadian and seasonal variation of migraine attacks in children. Headache 2006; 46: 1571-4. 6. Christensen AL, Rasmussen LH, Baker MG, Lip GY, Dethlefsen C, Larsen TB. Seasonality, incidence and prognosis in atrial fibrillation and stroke in Denmark and New Zealand. BMJ Open 2012; 2.6. Christensen AL, Rasmussen LH, Baker MG, Lip GY, Dethlefsen C, Larsen TB. Seasonality, incidence and prognosis in atrial fibrillation and stroke in Denmark and New Zealand. BMJ Open 2012; 2. 7. Owens N, McGorry PD. Seasonality of symptom onset in first-episode schizophrenia. Psychol. Med. 2003;33: 163-7. 8. Procopio M, Marriott PK, Williams P. Season of birth: aetiological implications for epilepsy. Seizure 1997; 6: 99-105. 9. Procopio M, Marriott PK. Seasonality of birth in epilepsy: a Danish study. Acta Neurol. Scand. 1998;98: 297-301. 10. Procopio M, Marriott PK, Davies RJ. Seasonality of birth in epilepsy: a Southern Hemisphere study. Seizure 2006;15: 17-21. 11. Manfredini R, Vergine G, Boari B, Faggioli R, Borgna-Pignatti C. Circadian and seasonal variation of first febrile seizures. J. Pediatr. 2004;145: 838-9. 12. Cortez MA, Burnham WM, Hwang PA. Infantile spasms: seasonal onset differences and zeitgebers. Pediatr. Neurol. 1997;16: 220-4. 13. Danesi MA. Seasonal variation in the incidence of photoparoxysmal discharges among patients investigated after a single seizure. J. Neurol. Neurosurg. Psychiatry 1989;52: 799. 14. Baxendale S. Seeing the light? Seizures and sunlight. Epilepsy Res. 2009;84: 72-6. 15. Danesi MA. Electroencephalographic manifestations of grand mal epilepsy in Africans: observation of relative rarity of interictal abnormalities. Epilepsia 1988; 29: 446-50. 16. Holló A, Clemens Z, Kamondi A, Lakatos P, Szűcs A. Correction of vitamin D deficiency improves seizure control in epilepsy: a pilot study. Epilepsy Behav. 2012;24: 131-3. 17. Christiansen C, Rodbro P, Sjö O. "Anticonvulsant action" of vitamin D in epileptic patients? A controlled pilot study. Br. Med. J. 1974; 2: 258-9. 18. Siegel A, Malkowitz L, Moskovits MJ, Christakos S. Administration of 1,25-dihydroxyvitamin D3 results in the elevation of hippocampal seizure threshold levels in rats. Brain Res. 1984;298: 125-9. 19. Kalueff AV, Minasyan A, Tuohimaa P. Anticonvulsant effects of 1,25-dihydroxyvitamin D in chemically induced seizures in mice. Brain Res. Bull. 2005;67: 156-60. 20. Borowicz KK, Morawska M, Furmanek-Karwowska K, Luszczki JJ, Czuczwar SJ. Cholecalciferol enhances the anticonvulsant effect of conventional antiepileptic drugs in the mouse model of maximal electroshock. Eur. J. Pharmacol. 2007;573: 111-5.